I’m back once again to check out the latest episode of the CW Seed’s webseries that ties in with both Flash and Arrow from the fine folks at DC Animation. As usual with this series there is no embedding, so if you would like to watch the episode click on the link below and watch it over at the CW Seed website, or you can download the app and watch it on your phone or tablet. While I initially liked the concept of catching back up to the intro in episode 1 where Mari was being chased by Flash and Arrow, it wasn’t quite as satisfying as I thought it would be because so much of that initial episode was re-used. There are brief moments in between the repeated shots that adds a little bit more to the chase, specifically from Flash & Arrow’s perspectives and of course, we get to see Mari finally take that last step that she couldn’t earlier and call upon the spirit of the eagle (or possibly hawk, it went by quick and I’m not a bird expert) and fly. And the episode ends with a full look at the villain of this webseries, although we still don’t get to find out what her name is just yet. It was another fun episode overall, the Flash and Arrow interactions were nice to see and those extra moments did add quite a bit to the repeated scenes. 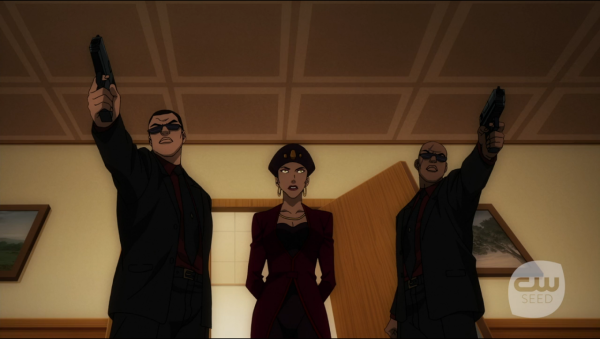 Another downside is that it ends with two guards pointing guns at Mari, but we just saw her outmatch Arrow and the Flash, what are two thugs with guns really going to do to her? It does feel like it’s winding down overall and I haven’t looked it up, but I would guess that this series ends one week before Flash and Arrow start back up again. We’ll just have to wait and see.